March was marked by the confluence of our sediment research with a deepened understanding of the needs of fish. The team gathered for our second Charrette called the "Creek Charrette." Members from range of agencies and local groups managing the Creek got together to figure out how best to unlock the flows of Alameda Creek – both for sediment movement and for fish passage. The goal was to confirm our understanding existing conditions in the Alameda Creek Flood Control Channel, and discuss design opportunities that would be more suitable for fish habitat and sediment movement to the Bay. We’re particularly excited about designing “nudges” along channel that would help to manage sedimentation, flow patterns, and areas for fish habitat. Stay tuned as this nudging strategy develops! The team also visited the San Francisco Public Utility Commission (SFPUC) fish traps in the upper watershed and watched them tag 3 steelhead smolt for tracking. The SFPUC is monitoring fish populations before the new Calaveras Dam replacement flows next year. Some smolt are trapped and grow into Rainbow Trout, but these smolt pictured here are being tagged to track migration through the flood control channel and out to the Bay. Check out Alameda Creek Alliance’s page to learn more about how to restore historic Steelhead passage through the Creek. And right before we gave a mid-review presentation, the team went out to the Creek and and installed sensors in the tidal portion of the channel just below head of tide and where the creek meets the Bay - don't worry - we had permits. 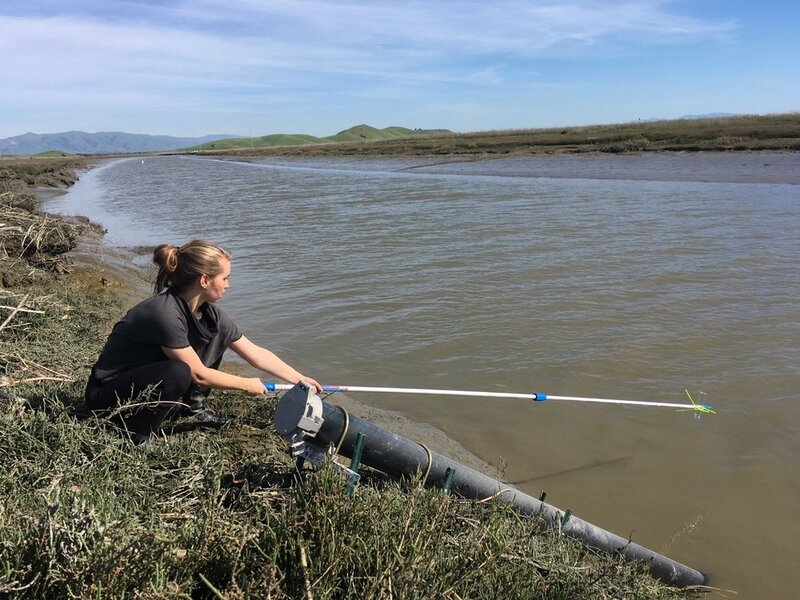 These citizen science mechanisms are both for collecting information and for inspiring engagement in the restoration of the sedimentshed of Alameda Creek. 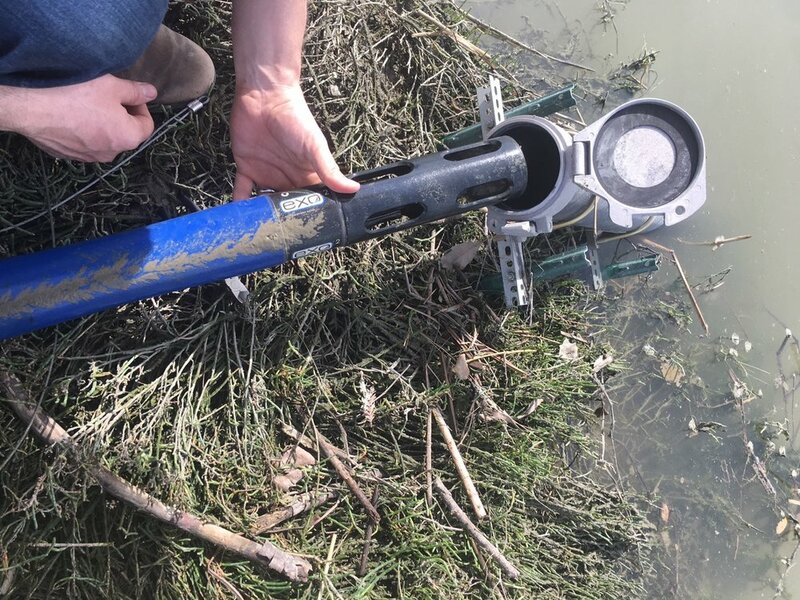 The sensors measure sediment by recording turbidity levels and the depth of the water. Water samples were also taken at different tide levels to understand the fluctuating character of water and sediment in the tidal portion of the Creek. Pictures of the install illustrate the methods of collecting water samples and installing the Exo3 Sonde. On April 19th, we'll have a workshop with the Robotics Club at JFK High School in Fremont to analyze the data collected and build our own sensors!